Today, the C&O Canal is used by millions of visitors who come to stroll, hike, bicycle, birdwatch, paddle, rock climb, ski, skate, or otherwise enjoy the natural corridor provided by the abandoned canal and towpath. The preservation of this linear riverside park is remarkable in the context of the explosion of development and population growth in the Washington, DC, metropolitan area and the eastern U.S. in general. Making it even more distinctive are the numerous connections to other trails and paths including the Capital Crescent Trail, the Potomac Heritage National Scenic Trail, the Appalachian Trail, the Western Maryland Rail Trail, the trail system in Green Ridge State Forest, and now the Great Allegheny Passage that connects Pittsburgh, Pennsylvania, to Cumberland. And in the past few years, considerable work has been done to establish a Potomac River Water Trail that depends on the access, campgrounds, and other facilities of the C&O Canal. More information about recreational opportunities within the C&O Canal National Historical Park can be found on their website. 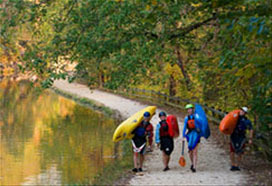 Below are links for more information about the various trails and paths that connect to the C&O Canal National Historical Park.